The Seattle Weavers' Guild meets on the fourth Thursday of the month, with exceptions for holidays and the summer break. If you are interested in guild membership or a particular program we invite you to join us. Visitors are always welcome. Meetings are located in Bloedel Hall, behind St. Mark's Cathedral: 1245 10th Ave East, Seattle, WA. The meeting starts at 10am, followed by "Hot Off the Loom" (members exhibit their latest work), and the morning program. Program speakers typically bring woven samples to accompany their talks, which are displayed on tables in front of the stage. After a lunch break at noon, the afternoon program follows, sometimes a hands-on project. Having always taken any opportunity to learn local textile techniques as she traveled, in 2011 Wendy Garrity found herself presented with an unexpected and unique opportunity during a year teaching music in Bhutan: a backstrap loom in a workshop of Bhutanese weavers with a master weaver assigned to teach her kushutara, or Bhutanese brocading. "For 8 months, I wove next to master weavers before and after school, learning without common language. These women became my Bhutanese family as we wove and sang together, drank butter tea, snacked on popped rice, and laughed and cried and joked using mime and the few words of English and Sharchop we had in common." Wendy will take us on a journey through the Kingdom of the Thunder Dragon, focusing on the unique Bhutanese woven textiles, and share stories of learning from weavers in tiny villages in Lhuentse as well as weaving alongside master weavers in the capital of Thimphu. This afternoon, Wendy will take us deeper into the mysteries of kushutara and reveals details that are not found in the handful of books published on Bhutanese textiles: how the intricate brocaded kushu stitches are executed. 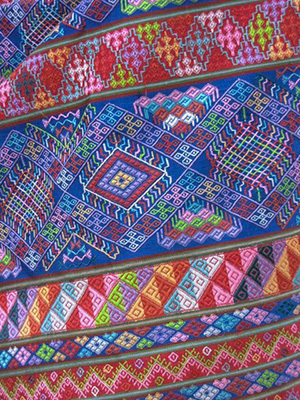 Find out how the Bhutanese create these beautifully textured designs that show on one side of the fabric only. Learn the details of the inlaid and coiled supplementary weft techniques used. This session will include a presentation on the 5 kushu stitches and a demonstration of those stitches, as well addressing topics raised during question time. At both programs, Wendy will display some of her collection of Bhutanese textiles affording you the opportunity to enjoy and examine them at close range. 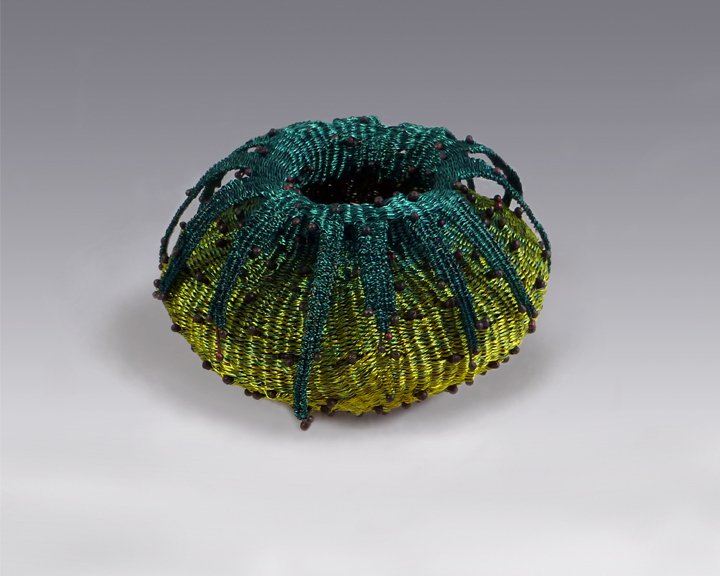 Wendy Garrity has a lifelong involvement with crafts and textiles, and a fascination with the traditional textiles of Asia. 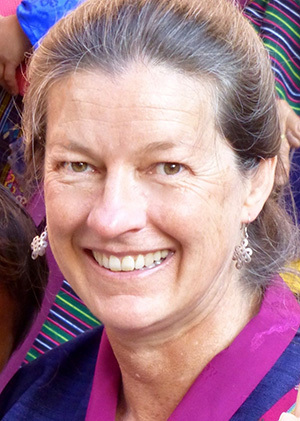 In 2010-2013 she took a career break to pursue her interest in textiles, women’s empowerment and grassroots development, combining volunteering and travel in Asia and South and Central America. Living in Bhutan for a year, she had the privilege of learning to weave kushutara, the intricate supplementary weft brocade used for women’s festival dress, as well as travelling across the country to explore other Bhutanese textile traditions. 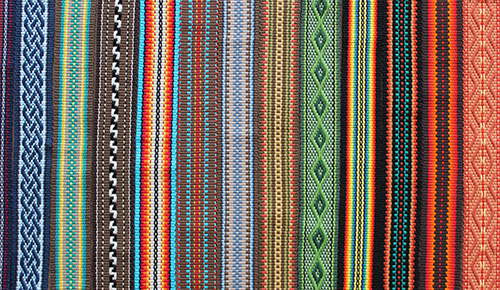 Returning to her native Australia, she adapted the kushutara techniques to western looms in order to share them with western weavers. She documents traditional textile techniques at textiletrails.com.au and promotes the sustainability of textile traditions at every opportunity. Afternoon Sample is Not a Four-Letter Word! Summer Kathleen M Hewitt with Barbara B. Suess Temari - Long Live the Chrysanthemum!